Never heard of them and probably glad too ! 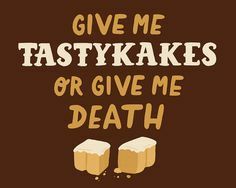 Tastykakes are packaged pastries, similar to Hostess Twinkies, Drake's Cakes, etc., and of course full of preservatives to extend shelf life. UGH... I would much rather get fresh stuff from a bakery. Good for you! In more ways than one. Sometimes, but I don't crave them as much as I do with other snacks.